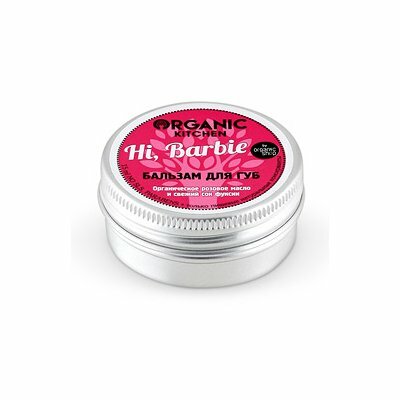 Hi Barbie Lip Balm is produced by the Russian beauty brand Organic Shop for its Organic Kitchen series. It's an effective lip care product formulated with organic rose oil and fuchsia juice. The balm effectively cares for the tender skin of your lips, nourishes, softens and moisturises it, provides your lips with vitamins and protects from cold, sun and harsh winds. Paraben-free. Organic rose oil contained in this lip balm nourishes and moisturises your lips, improves skin elasticity. Fuchsia juice also has a nourishing effect and helps to protect your lips against harmful environmental factors. The product is enriched with valuable vegetable oils such as shea butter, cocoa butter, coconut oil, olive oil, and castor oil. This blend of oils provides the skin of your lips with essential vitamins, fatty acids and other nutrients, keeps it hydrated, and makes your lips incredibly soft and supple. Another key ingredient contained in the lip balm is beeswax known for its pronounced anti-inflammatory, antiseptic and protective properties. It creates a reliable barrier against various aggressive external factors such as harsh wind, cold and UV rays. Directions. Apply onto lips as needed. Ingredients. Butyrospermum Parkii Butter, Organic Rose Flower Oil, Fuchsia Onagraceae Juice, Cocos Nucifera Oil, Theobroma Cocoa Seed Butter, Cera Alba, Ricinus Communis Seed Oil, Olea Europaea Fruit Oil, Tocopheryl Acetate, Aroma. Want to buy Hi Barbie Lip Balm? Call us or submit your order via our web site! Organic Kitchen is a cosmetic series produced by the Russian beauty brand Organic Shop. It includes over 100 products for hair, face and body care formulated with natural vegetable and essential oils, herbal extracts and juices. All Organic Kitchen products are free of parabens, mineral oil, SLS (sodium lauryl sulfate), SLES (sodium laureth sulfate) or any other substances that might cause irritation or allergic reactions. The Organic Shop brand was launched it 2010. It is owned by Pervoe Reshenie (First Solution), a well-known Russian cosmetic manufacturer. The company owns quite a few personal care brands which are popular both in Russia and its neighbouring countries. They include, but are not limited to, Grandma Agafia's Recipes, Planeta Organica, Natura Siberica. Organic Kitchen is one of the newest Organic Shop's series. Organic Kitchen means 100% natural beauty products formulated with an impressive amount of valuable natural ingredients such as fresh fruit and berry juices, essential oils, organic vegetable oils, herbal extracts, natural honey and even organic yoghurt. Organic Kitchen products transform routine personal care into a luxurious beauty ritual that gives you a mood boost that lasts for hours. And don't forget that these cosmetics are completely safe for your health and the environment!